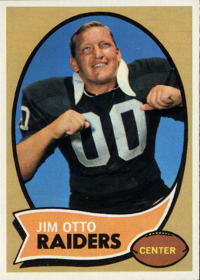 In case you weren't aware, the man most famous for portraying Apollo Creed had an NFL football career, albeit brief. Carl Weathers, a linebacker, played 7 games for the Oakland Raiders in 1970, and appeared in a single game for the club the following season. He then spent a couple of seasons in the Canadian Football league with the BC Lions before giving up professional football to focus on an acting career. 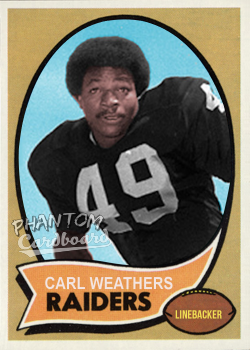 I decided to make a 1970 Topps football inspired Carl Weathers for two main reasons; the first being that the late Bob Lemke already did a 1971 style card, and the second being that Carl played the games in 1970 as opposed to one in 1971. I owe Mr. Lemke some credit as he colorized the black-and-white photo that I used for my card so I that's a task I didn't have to take on. The fonts on this one didn't pose much of a problem, so much of my time was spent cleaning up little imperfections. I not real confident about getting a TTM success from Mr. Weathers as I've got a few Rocky cards that have been pending for a long, long time. Even if I don't get mine signed it was still a cool card to make.